VKworld SD100 is an affordable mid-range smartphone with a beautiful body design and enough inbuilt memory. Although the phone is not from a popular brand, however, it’s quite an adorable device to buy. It’s still latest and a new phone that comes with a teardrop notch and combo cameras. Going by the design, the Vkworld SD100 is adorable. Although the phone is built with a plastic body, it still maintains a decent budget device. The panel that is wrapped with plastic host a dual camera set-up that is beautifully placed on the top. The camera is arranged alongside an LED flash with a fingerprint sensor below. The phone has curved edges with small bezels on the sides of the screen. The handset is available in Black and Blue colors. The Vkworld SD100 has a waterdrop notch with a small bezel on the bottom of the screen. It has a screen size of 6.0 inches HD under IPS capacitive touchscreen with a resolution of 1280 x 600 Pixels and 236 PPI density. The screen comes with display protection that is scratch resistant and packs 18:9 Aspect ratio. On the camera aspect, the Vkworld SD100 has a combo rear camera of 8 Megapixels + 5 Megapixels built by Samsung. The camera is paired with dual LED flash and it has other internal features that will ensure sharp images. It also has the ability to record 1080p@30fps, 720p@30fps videos resolution. Up front, you will get a single snapper of 5 Megapixels with Interpolated resolution – 8 MP paired with an LED flash as well. 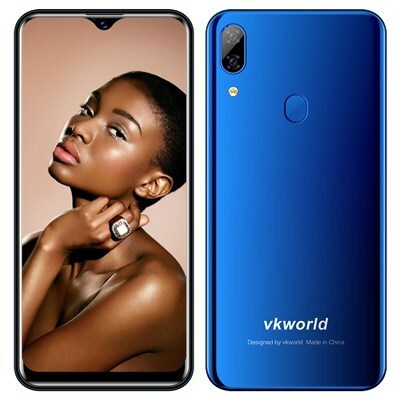 The Vkworld SD100 has MediaTek MT6580A chipset built with 28nm process technology which has a quad-core processor that clocked at 1.3GHz speed. The ARM Mali 400-MP2 is for graphics which will enhance the gaming experience. The phone is powered by Android 9.0 Pie operating system. The Vkworld SD100 has inbuilt storage of 16GB which is average and it has a slot for micro SD card up to 32GB. The phone has 2GB of RAM for smooth performance. Apart from the rear-mounted fingerprint sensor, other sensors on the device include Proximity Sensor, Accelerometer, Ambient Light and Compass. The phone has dual SIMs slot which supports 2G and 3G. Other options on the connectivity include Wi-Fi 802.11 b/g/n, Wi-Fi HotSpot for wireless connection, Micro USB v2.0 for charging and files transfer and GPS, A-GPS for navigation. The Vkworld SD100 has a nonremovable battery capacity of 3200 mAb without fast charging technology. On the price, the phone will sell at a price of $119.